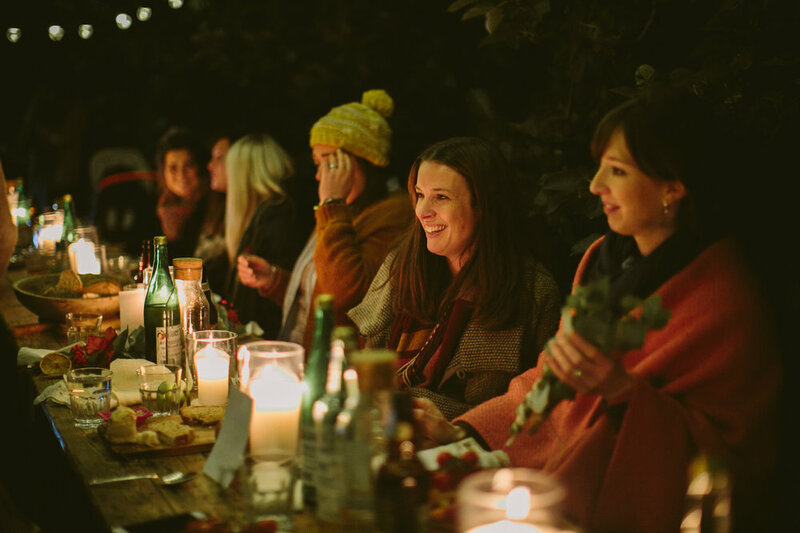 A fortnight ago, in the twilight of a mild October evening, 20 creative women gathered to share food, conversation and a little creativity. The idea of what is now Assembly Gatherings is something that mulled around my head for quite some time. I love the creative community that social media, particularly Instagram has provided me with, but for me there is nothing like properly meeting people in the flesh, and hearing their voices and stories. 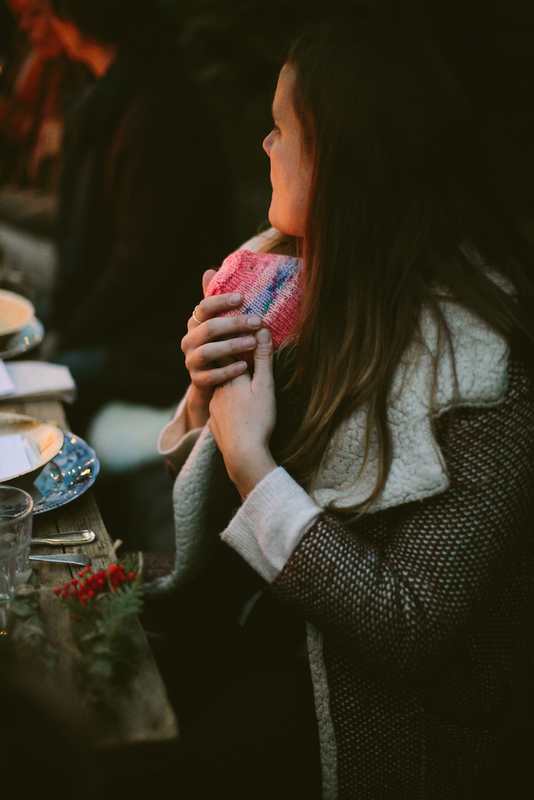 I hoped that I wasn't alone in that desire, in needing that creative community to be propelled into real life so I thought it might be good to trial getting a small gathering of people together for an evening of simple pleasures like eating, making and chatting. Thankfully everyone I talked to was excited by the idea and I got the sense that it was something we were all craving - that tangible experience outside of phones and laptop screens and working solo to bring our creative lives to the fore. Looking back, I'm so grateful for these ladies who came, taking a chance on this event, signing up and coming out knowing very little about what they were coming to. It was brave of them and I'm so glad they did. It's funny to use the term 'creative' as a criteria for those attending, as I know many of them wouldn't necessarily prescribe to that title - but to me being a creative person is so open, so wide. There were people there in various professions - some in full-time creative work (photographers, musicians, artists, designers) and some working hard in other important roles who also need the intentional nourishment of creativity community because it's in their bones to make and create. 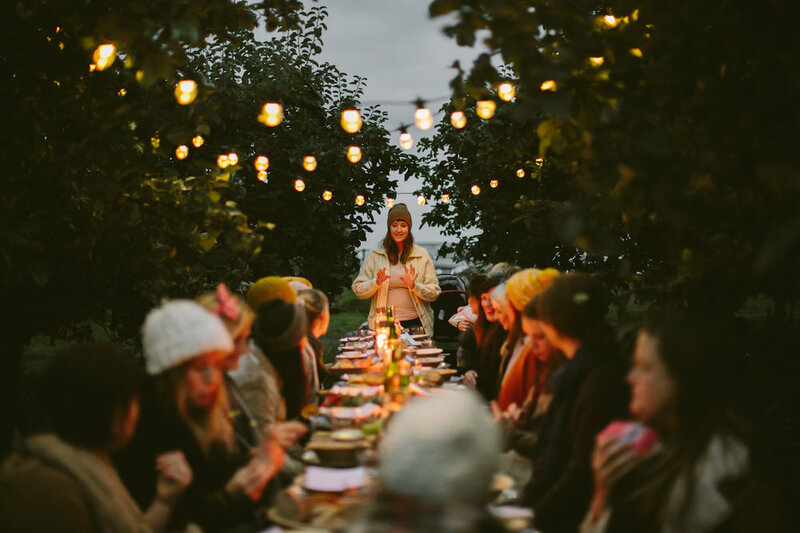 I had my heart set on an outdoor event - dinner and a workshop in an orchard in the Autumn. Assembly is intentionally a seasonal gathering. I feel like it helps keep us connected to certain rhythms in our year and is a nice way to give a nod to nature and the changes going on around us - maybe even inspire us differently in some way when we stop to notice these seasons change. In some senses, an outdoor event setting keeps things really relaxed and informal but in another way it can be intimidating - no walls to lean against, corners to hide in etc. Just all of us, outside, under the big sky and the heaving apple trees. 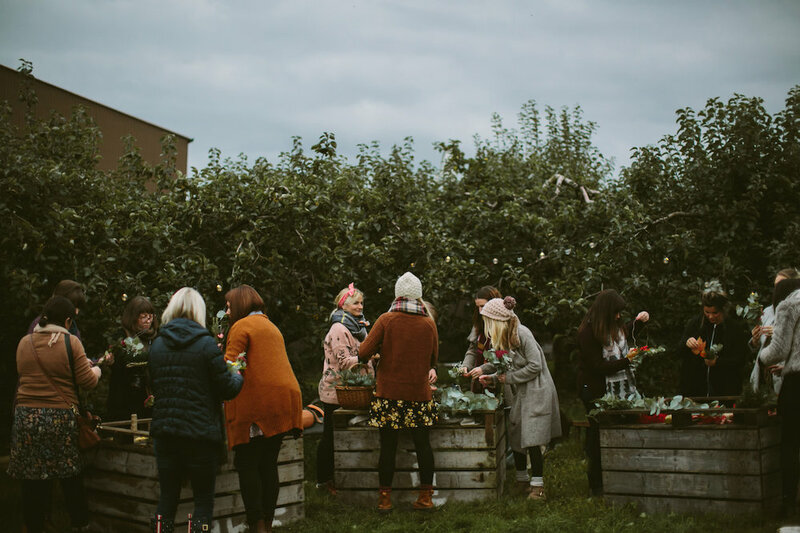 Our venue was in the most beautiful orchard, owned by the McKeever family where they run a local business producing cider here in Portadown. We were welcomed by them with such incredible hospitality and warmth and I am so grateful to Pat, Peter and the family for going out of their way to accommodate us and take a risk on my idea. Everyone arrived, trickling into the orchard for hot cider - a little anticipation in the air about what the night would hold. It was lovely to see people meet each other in real life that had long been friends online and to listen to conversations begin and people start to connect. To be honest, I am a novice when it comes to making something like this happen. I love ideas, concepts and visions for things but I knew that I needed some help in bringing these ideas to life. Thankfully the totally amazing Grace from Grace & Saviour came on board to help execute the feel of the event and we were on the same page from the very beginning about it all. 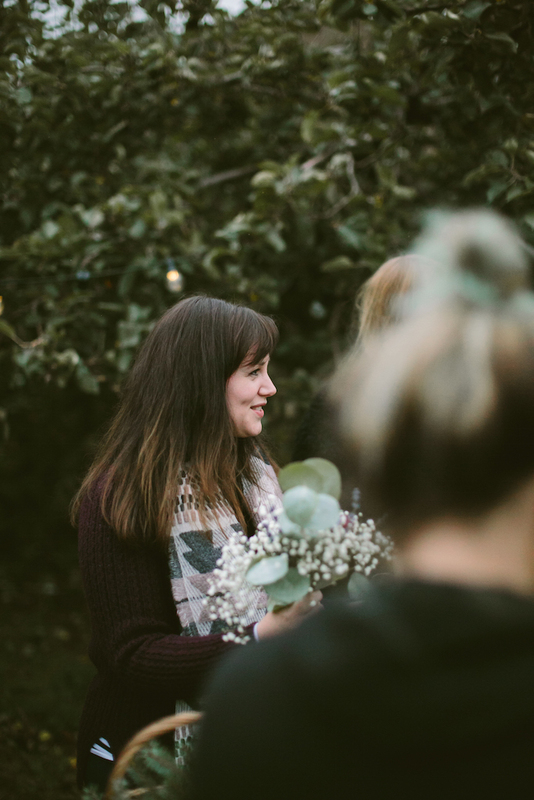 We shared ideas over pinterest boards and spreadsheets and I think it's safe to say that Grace's expert styling touches really made the whole evening magical. It was exactly how I imagined it would be. 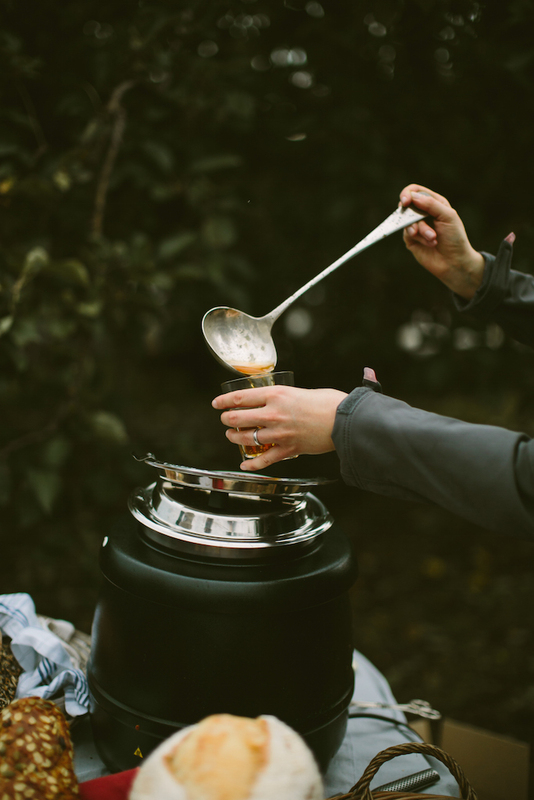 Once everyone had arrived and was warmed by the cider, we dug into a bit of making. I met Elizabeth through Instagram and love how creative she is with flowers and photography so I asked her if she would host a little bit of a workshop to help ease everyone into the gathering. Making is such a leveller, eh? There is something so distracting and wondrous about putting things together with your hands that can really get conversation going and loosen us up (that and the cider). Elizabeth gorgeously arranged some making stations where everyone could have a go at putting together their own smudge sticks - tied bunches of flowers and herbs that can be hung and dried and then burned in the home to offer a relaxing and cleansing fragrance. Everyone got stuck in and I think it helped us all relax into the evening. After the making, we all gradually moved to the table - now laden with bread, oils and crudites. The night had fallen and so we sat in the middle of the orchard and feasted by the light of candles and festoon lights hung from the apple trees. I was so glad to enlist the wonderful Sarah from Little Pink Kitchen to take care of the food for the gathering. I have long admired Sarah's work, her journey to launching the business she loves and she has such a brilliant creative way with food. We invited attendees to bring their favourite bread for sharing and Sarah took care of the rest. 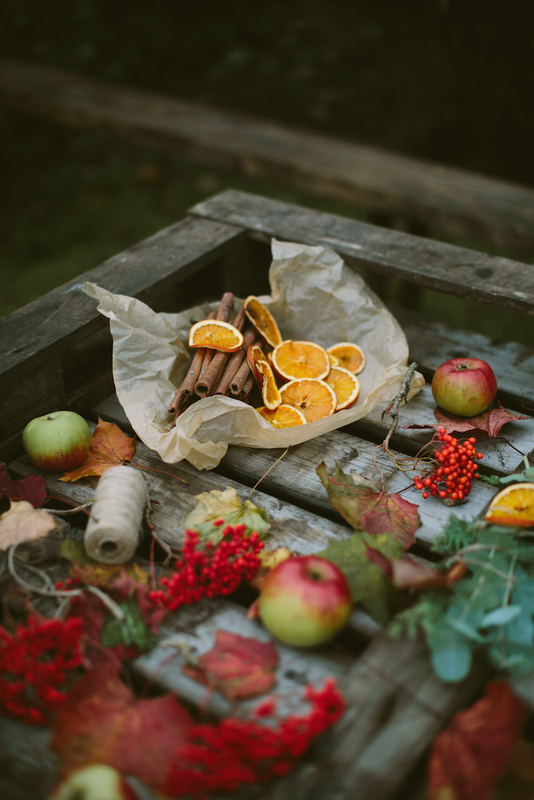 From crudites, oils, stews and homemade cinnamon madelines, Sarah made sure all the food was locally sourced and she put such a delicious spin on the menu that it can only be described as cozy autumnal heaven in your tummy. We were all blown away by how incredible the grub was and Sarah was so relaxed about it all - basically catering in the dark for most of the evening! I was unnecessarily worried about conversation flowing beforehand so I prepared some questions and thoughts to get everyone chatting - totally unnecessary! It was really amazing to see the honesty flowing around the table - sharing about what it means to 'have it all', the struggles to maintain priorities and creativity amidst our busy lives. 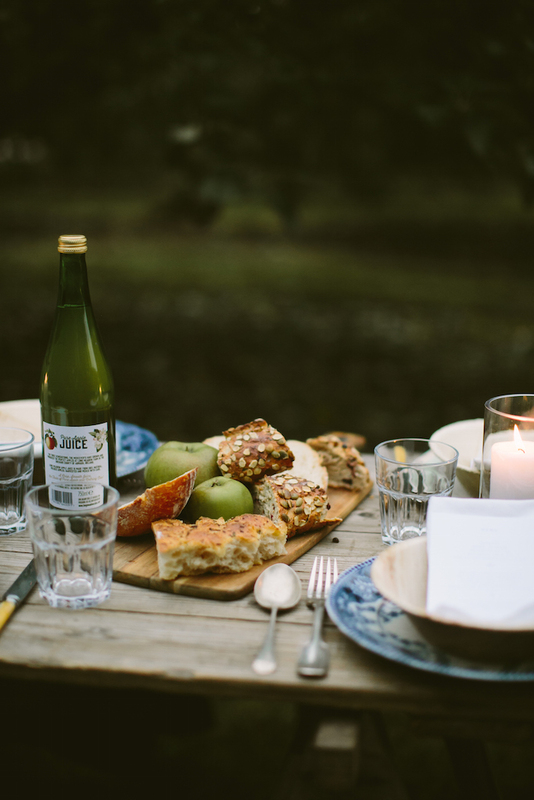 I'm still relishing in some of those conversations had and those overheard as we sat together, dipping breads, drinking cider and sharing. After dinner we moved back to finish the evening gathered around the fire, drinking hot chocolate, devouring Sarah's homemade cinnamon madelines and toasting marshmallows. We brought blankets but the night was mild and I spent a bit of time reading from Liz Gilbert's 'Big Magic' on how we are born creative - it was a passage that came as a relief to me when I first read it so I thought I would share it with everyone. From that we went around and each shared our journey and what our creative pursuits look like. It was such an encouragement to listen to each other and find space to be vulnerable about where life has taken us. We finished the night lighting sparklers, promising to stay in touch and exchanging contact details with new friends. Yes, it was a bit like Girl Guide camp, but with less spider bites and crying for your parents to come and pick you up. Such an inspiring group of talented people; an honour to be around and learn from. Sigh! I want to do it all again right. now. 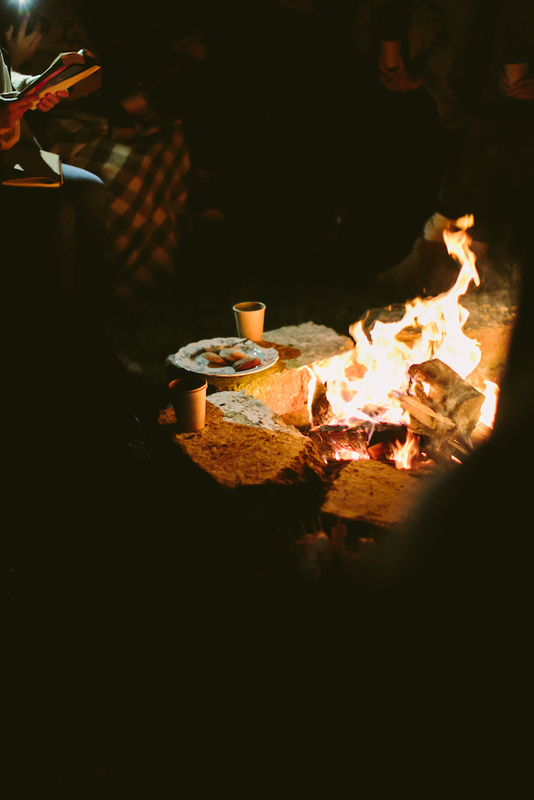 Plans are swirling around for the Winter Gathering and ways to develop this idea of meeting together for simple pleasures and creating community around our mutual love of creative things. I know there is such a deep pool of creative and inspiring people doing amazing things here in Northern Ireland and our numbers for the first one could have been huge. I hope to open this out for others seeking the same space and will be releasing information over the next number of weeks and months ahead of the next one to my newsletter subscribers. I'm sending out my November newsletter this weekend which will have some extra info about what we discussed at Assembly, including our manifesto - so if you want in on the action, please do sign up at the bottom here. In all, I think its good and important to take time out to do what brings you to life, what keeps your spark alive and helps you connect with people that understand you. 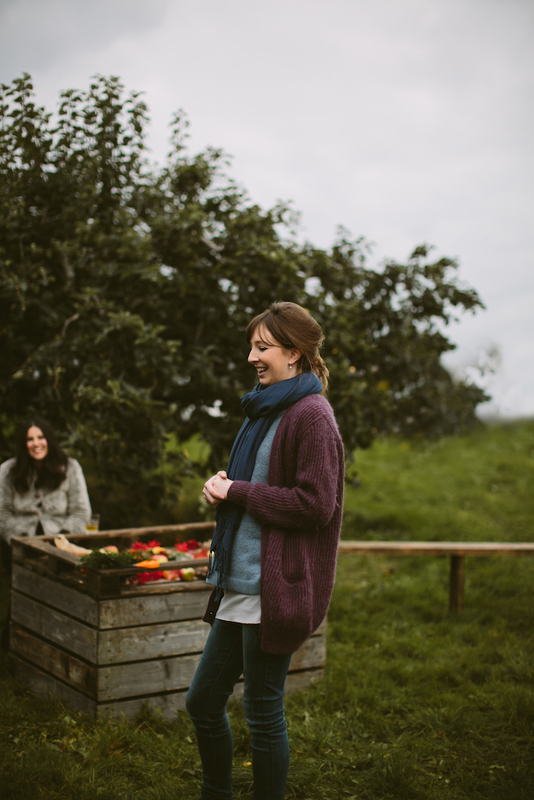 Big thanks again to Ben from Angel & Anchor for the Assembly branding, to Grace from Adam & Grace Photography for capturing the gathering in these beautiful images, Grace & Saviour for styling, Elizabeth for hosting the workshop, Sarah from Little Pink Kitchen for her mad cooking skills and the McKeevers for allowing us to take over their orchard during the busy harvest season. AND - my awesome parents for helping with the set up, washing dishes, lighting fires and taking care of the baby while I hosted. What a team!